http://www.youtube.com/watch?v=xKmhS4qLj_s http://www.youtube.com/watch?v=9G1dhkRJ3ak(A) Motion:The action or process of moving or of changing place or position or change in distance over change in time. 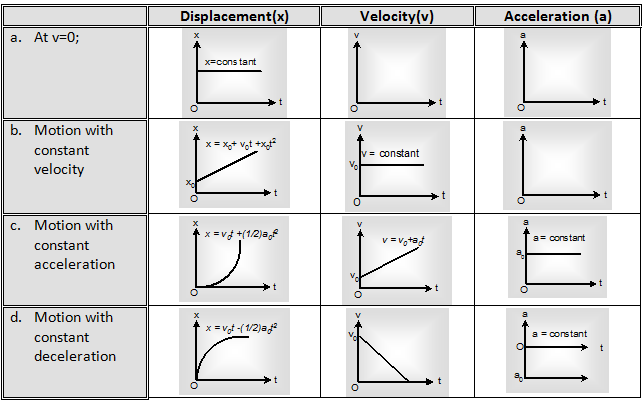 Acceleration: Change in velocity over time. Motion is relative, constant motion, no change detected. The last one is not traditionally thought of but while a spring moves on a linear path it is caused by deformation of the metal. 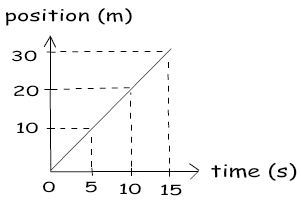 As you see on the graph, X axis shows us time and Y axis shows position. We observe that position is linearly increasing in positive direction with the time. We understand from this linear increasing, our velocity is constant. If it was not constant we would see a curved line in our graph. Now, we use this graph and make some calculations. (B) Motion 1D problems can be broken down or separated into one or more 1 Denominational problems. You set up a coordinate systems with positive and negative directions (obviously). Scalar- has only a magnitude, area or temperature. Vector- has magnitude and direction like displacement or velocity. Analyzing the motion of objects, 4 basic parameters; time, displacement, velocity, and acceleration. Time is scalar while the other three are vectors. It's rather hard to identify the difference between scalar and vectors in 1D. Displacement- represents distance traveled, final position (x), starting position (y). Say you start in one position and move North 5 meters from where you started, your displacement is 5 meters North. If you turn around and go back with a displacement of 5 meters South. You would have traveled a total of 10 meters. Your net displacement is 0 because you're back where you started. (E) A free-body force diagram is used to show all the forces acting upon an object to predict the net force and ultimately the path of the object. or 'real' rest. Rest and motion are always with reference to something else.